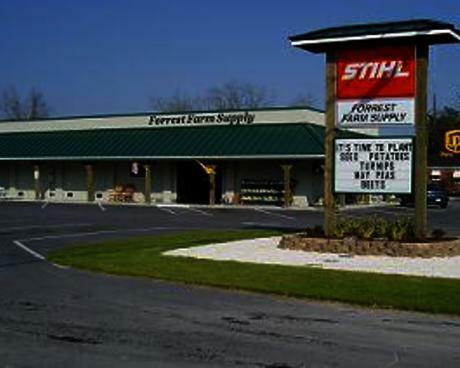 Forrest Farm Supply is a local owned and operated hardware, lawn and garden and farm supply store located in Bayboro, NC. Ralph and Joyce Forrest purchased FFS in 1969 with teenage son Chuck on board to help run the business. Chuck and wife, Wanda, currently operate the business with their team of dedicated employees. FFS has serviced this small rural coastal Eastern NC county as a Stihl Elite OPE Dealer, lawn and garden center and farm supply providing fertilizer and lime and custom application to local farmers. FFS has always supported the local schools as a Corporate Booster sponsor as well as local churches and non-profits in their fund-raisers. FFS was recently again challenged to meet needs of the people in a Hurricane Disaster Recovery effort. On September 13th, 2018 Hurricane Florence came and lingered over Pamlico County leaving behind much damage to homes, businesses and property. Prior to the hurricane, Chuck purchased a box trailer and drove to Mid-Atlantic Stihl to bring back 150 chainsaws, bars ad chains to be prepared. Chuck and Wanda stayed to the store during and following the hurricane and opened doors to the local fire and rescue departments during and after the storm. FFS employees came in the day after Hurricane Florence and worked non-stop for the next 10 days to help the county folks get what they needed to repair and secure their homes. After the initial recovery period, FFS has continued to serve the needs of the Disaster Recovery groups who have come to Pamlico County from all around the US. Chuck an Wanda and the Forrest Farm Supply team will proudly continue to serve the county which has supported them for the last 50 years. As we say, "Stop and Shop Local. We appreciate your business!"